What is Ninja Forms – Confirmation & Reminder? 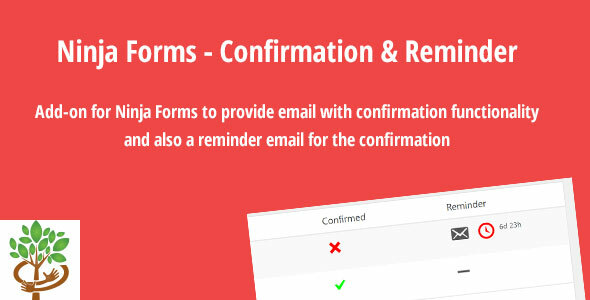 The addon Confirmation & Reminder for Ninja Forms is a great plugin to provide some extra functionality in Ninja Forms. The addon creates a new action to send a confirmation mail after submitting a form. In this confirmation mail the user will be provided an unique link. After clicking this link the user will be confirmed. By showing a new column in the submission view you can see which user of the form has confirmed their submission. You can use this for example for forms in which people can sign up for events. Ofcourse it can happen that someone forget to confirm, therefore I provided a reminder function. This mail will be send after a specific amount of days (you can change that). You can customize this mail as well. You can also hook in the confirmation with your own function. Redirect to different pages for succes with confirmation, already confirmed or errors. Overview of confirmation / reminder status in the submission view.